The picture below shows a building nearing completion in the city. The site is on the corner of Turbot St and Albert St, with this view being of the Turbot St entrance to the building, the Brisbane Dental Hospital. This photo was taken in 1940, and the hospital was opened in 1941 as a clinic and also a teaching facility associated with the University of Queensland. This building was part of the Turbot St Development Scheme that was devised by Brisbane architect Raymond Nowland of the State Works Dept. His very laudable idea was to include a public library and an art gallery, together with this building, in a precinct adjoining Wickham Terrace, bounded by Turbot St and Jacob's Ladder. Regrettably, the Dental Hospital was the only building that eventuated. However, Nowland was kept busy in the very extensive public works that occurred in the late thirties and early forties. 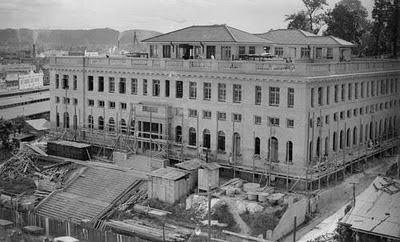 His other work included the Brisbane Clinic on Wickham Terrace and the Police Barracks on Petrie Terrace, as well as the Mayne Medical School featured in our last post. This attractive neo-Georgian building remains on Turbot St and is still a Dental Clinic and College. The attractive lines are evident in my recent photo above. Some interior refurbishing took place in the 1990s to ensure best practice in dental care. What a shame that other works proposed by Nowland for this area did not see the light of day. What a very fine exterior! When you say Nowland also intended to build a public library and an art gallery in a precinct adjoining Wickham Terrace, was the money ever guaranteed? Or was it just a dream? And what when up on those blocks instead of the public library and art gallery? If it was something wonderful, I don't mind. But if it was ugly.. or private... then I mind terribly. I think we ended up with more government offices - I'll have to check! Wasn't the SGIO theatre a concession to the original arts precinct idea? All gone now though, sadly turned into a carpark. Yes, the SGIO/Suncorp Theatre was the home of (Royal) Queensland Theatre Company until the Southbank cultural precinct was developed.